Christmas trees are hot topics of conversation around the holidays. How early can you set it up? How long can the tree stay out after Christmas? Nissan seems to think that December 28th is the appropriate day to take the tree out to the curb, and of course the automaker had to dispose of it in a comical manner. The Japanese automaker released a video on Facebook Monday that shows Formula Drift racer Chris Forsberg (named in an earlier post) checking out his post-Christmas “To-Do” list. Items on the list include taking down lights on the house, driving a family member to the airport, and thanking his grandmother for the underwear. At the very bottom of the list is the task to “un-decorate” the Christmas tree. Forsberg exits the car and attaches the end of a string of lights to the back of the vehicle. As he puts the pedal to the metal, the tree, pulled by the lights, spins. This effectively cleans the tree of all lights, candy canes, and ornaments. Just in case you need a reminder, don’t try this at home. The Nissan GT-R is not meant to tow anything. Take a look at the stunt below. It’s always a drag to take down the tree. This year, we used a GT-R to speed up the process. At my house, there is a system to how the tree is decorated. We then take everything down in the reverse order to make sure nothing gets broken or tangled. 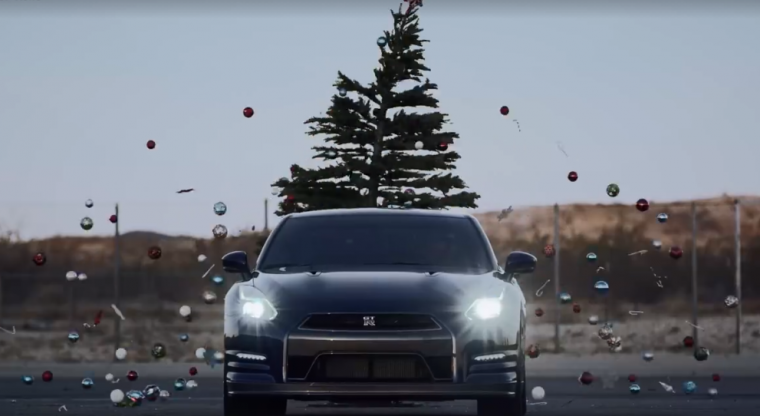 If you’re planning on taking down your tree the Nissan way, however, don’t count on many of your ornaments making it to next year.